It’s the handwriting activity your child will be clamouring to start: writing to Father Christmas! Gather your child’s paper and pencils and settle down to compile the list, then organise a response from the big man himself, as well as a personalised Christmas message. Harness your child’s seasonal enthusiasm! Sit down at the table together with a pen or pencil and some lined paper (it helps children write neatly and evenly across the page). Turn off the TV or radio to minimise distractions and check your child’s posture; they should be sitting comfortably with their feet flat on the floor and their back straight. In Reception your child’s message to Santa will probably be more pictures than words, but you could help them to write their name at the bottom of the page, or copy the words ‘Dear Father Christmas’ at the top. In KS1, help your child plan their letter with our Father Christmas handwriting template – they won't even realise they're doing some handwriting practice at the same time! 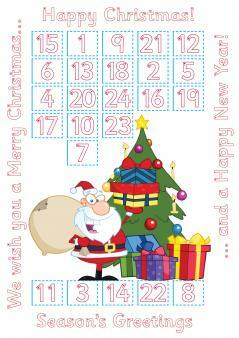 They could also make their own Picture Advent calendar to help them count down to the big day. By KS2 your child will probably be happy to show off their best joined-up handwriting on such an important letter; if they’re too old for this activity you could ask them to help any younger siblings compose their list, instead. Whether they’ve written one word or a side of A4, show appreciation for the effort and shower them with praise. Why not take a photo of your child’s letter every year? Next year, you’ll be able to show them how much their handwriting has improved (the photo serves as a very useful aide-memoire to Father Christmas, too!). 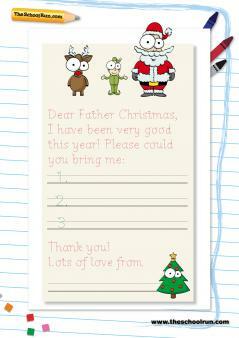 Reward your child’s handwriting efforts with a reply from Father Christmas himself! A free letter is sent by Royal Mail to every child who sends their letter to this address: Father Christmas, Santa’s Grotto, Reindeerland, XM4 5HQ (remember to put your return address on the envelope!). If you'd like your child to receive a reply direct from the Arctic Circle, you can write to Santa's "official" address in Finland, where 500,000 letters from all over the world are processed: Santa Claus, Santa Claus' Main Post Office, Tähtikuja 1, 96930 Arctic Circle, Finland. A reply from Santa and his hard-working elves is available (in English and 12 other languages) for €8.90. You can organise a letter from Father Christmas for a child who is partially sighted with the RNIB’s scheme, which will send a reply in Braille, large print or audio format. Or, you can support the NSPCC with a letter to Santa – you can choose an age category and personalise your letter with your child’s name, age, address, gender and best friend’s name for a suggested donation of £5. (Your child's letter can also be written in Welsh.) Request your Letter from Santa online. Make it a new Christmas Eve tradition – watching a personalised video message from Santa to your child. You can prepare one for free on the Portable North Pole, complete with naughty-or-niceometer and a photograph of your child. You can create a basic message for free, or buy a premium video.